Persian weddings in Mexico are one of our specialities. The complexity and joyfulness of the ceremonies, the meaningful traditions, and the color and fun make Persian destination weddings one of our favorite types of events to photograph. 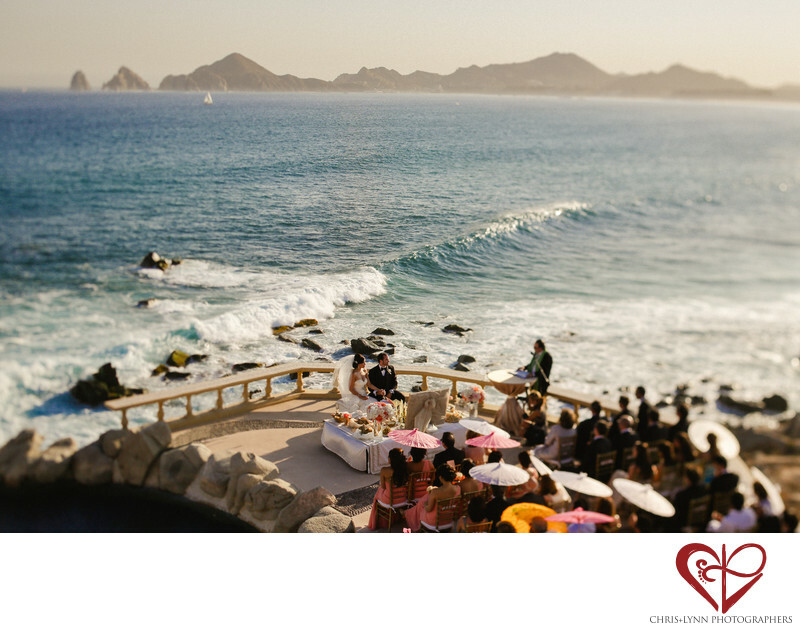 This image was shot at the couple's Mexico destination wedding in Cabo, Mexico. The couple chose the location because of its incredible views of the ocean and of Land's End, the distinctive in the distance that rises from the water from the end the Baja Peninsula. I love the way this image shows the overview of the couple's setting and wedding ceremony. The blue of the water and sky contrasts with the bright colors of the guests' parasols and looking at the waves rolling in, you can imagine the sound of the ocean and wind. This vantage point, high above the couple, really gives a unique perspective. The image is photographed with a Canon 45 mm 2.8 tilt shift lens. This lens, normally used for architecture photography, allows the photographer to manually Shift, Tilt and Rotate the lens axis angle relative to the focal plane. The result is images with a selective focus on one aspect of the composition while the rest of the image is blurred. We like the the tilt shift lens to add a more evocative, surreal look to some wedding photos. 1/400; f/5.6; ISO 200; 45.0 mm.